AIG Probe – Business Insurance reports that New York officials are appointing an outside consultant to audit insurance premiums at American International Group Inc. because workers compensation premiums were improperly booked for more than a decade, according to a Spitzer spokesperson. Law Professors Peter Henning and Ellen Podgor discuss this in greater detail in Ignoring Legal Advice at AIG on their intriguing White Collar Crime Prof Blog. Thanks to Doug Simpson of Unintended Consequences for the pointer. New business blog – BusinessWeek Online has launched its own blog, Blogspotting, where the worlds of business, media and blogs collide – we’ll add this to the sidebar. Thanks to B. Janell Garnier at Benefits Blog for the pointer. According to the BLS, there were 5,559 workplace deaths due to traumatic injuries in 2003, a slight increase from the number of deaths in 2002, when 5,534 workplace deaths were reported. The AFL-CIO released its 14th annual death on the job report. Access the full 154-page report — Death on the Job, The Toll of Neglect (PDF) — or read Jordan Barab’s excellent summary of report “highlights”. Also, visit rawblogXport for some links to various labor sites commemorating Worker Memorial Day 2005. It would be good to see a larger focus on this topic in the media, but in doing a Google search we were disappointed to find little on the topic. We found an article noting that Wyoming has the dubious distinction of the most work fatalities, with a rate of 13.9 deaths per 100,000 workers vs. the national average of 4 deaths per 100,000 workers, and one other article about the death rate for Hispanics on job climbing in Colorado. I guess everyone is busy with the Michael Jackson trial. I wonder how many deaths the media could help prevent if only a small fraction of the attention that was devoted to the Terry Schiavo case could be devoted to this important issue? It’s also disappointing that little progress had been made in legislation to prosecute serial killers – those employers that willingly and knowingly flout basic OSHA safety standards resulting in repeated worker fatalities. Immigrant workers are particularly at risk of losing their lives on the job. The best thing we can all do to commemorate the 5,559 people who died on the job is to redouble our commitment to work safety and injury prevention. I’ve worked with conscientious employers who have experienced a work death – the horror of such an event and the lasting trauma on the families, on other workers, and on managers and supervisors can’t be adequately conveyed. Employers, this is a truly terrible lesson you do not want to learn the hard way – don’t let a preventable work death happen on your watch. Here are related posts that we’ve made since last year’s event. Note to FedEx: Beware of Massachusetts! We have been tracking the fortunes of FedEx, the ubiquitous delivery service that relies on the services of 17,000 “independent contractors” to deliver the goods. They tout their entrepreneurial strategy as a legitimate alternative to traditional employment. Indeed, when you put UPS and FedEx side by side (which Braun Consulting has done here), you are confronted with two polar views of the delivery business. UPS expects to build loyalty and commitment by hiring their drivers as employees and providing full benefits. Their drivers are union members with annual salaries capping out around $70,000. On the other hand, FedEx depends upon the energy and initiative of “independent contractors” to perform very similar work. These “independents” receive no benefits and must provide their own trucks. However, with prime delivery routes they might pull down as much as $100,000 per year. FedEx managers would do well to read the Massachusetts’s Attorney General’s advisory on independent contractors (see our February 28, 2005 blog). FedEx lost their case for independence in California and they appear doomed to a similar fate in Massachusetts. The AG’s advisory on Independent Contractors states that in order for a contractor to be independent, they must be “free from the control and direction” of the general contractor. With FedEx providing uniforms, logos and delivery routes, it will be difficult to demonstrate true independence on the part of the drivers. Even more compelling, FedEx must prove that the work performed by the independent contractor drivers is different from that performed by the general contractor. Given that FedEx’s only business is delivery and the “independent contractors” are delivering the goods, there is simply no way they can get past this one. FedEx is upfront and proud of its strategy. Theirs is an “in your face” defiance of traditional views on independent contractors. They have undoubtedly set aside a huge stash for legal fees to fight a state by state war of attrition. We are humbly suggesting that the reserve a goodly portion of those legal funds for the Bay State. Indeed, a court loss in Massachusetts opens the door to all kinds of employment law violations, up to and including large fines and even jail terms. Meanwhile, the AG’s ruling on independent contractors has come under new scrutiny for its unintended consequences. If you follow the language of the advisory, you find that part-time bookkeepers, attorneys, auditors, health care professionals and the like may fall under the definition of employees, and thus may be able to sue their clients for violations of a variety of employment related laws. Far fetched? Perhaps. But I have a vision of court documents winging their way through the streets of Metro Boston, many of them delivered with timeliness and aplomb by the uniformed and “independent” drivers of the FedEx corporation. Posted in Business | Comments Off on Note to FedEx: Beware of Massachusetts! Business blogs – do they work? According to Business Week, there are now more than 9 million blogs, with 40,000 new ones popping up each day. Yikes. In an article entitled Blogs Will Change Your Business, BusinessWeek Online discusses how blogs are migrating from the personal and hobbyist realm to the business arena. The article is interesting and informative in so far as it goes, but I was hoping it might focus on some real world examples of small businesses that are actually using blogs. Needless to say, we are a strong proponent of business blogging, but with some caveats – it would be our hope that blogs can help to create a more authentic dialogue with business customers and the general public, not simply be another advertising channel. No one is interested in reading more sales brochures disguised as dialogue. I’m a bit of a Web obsessive so I’ve been reading and following blogs almost since they first came on the scene in the late ’90s – even before they were called blogs. I first followed a few favorite tech, art, and general interest blogs, and now I have several hundred favorites I visit with varying regularity. Even though blogs were assumed to be personal in nature almost by definition, I thought they could and should play a role in business communication, too. They afford an unfiltered way to communicate with various constituencies. But the trick for business blogging would be to achieve authenticity – and since most companies are only accustomed to speaking to constituents through the filters of advertising and PR, achieving authenticity is a distinct challenge. Two years ago, a few of us began talking about a blog for Lynch Ryan. We thought it would be a great vehicle for helping our client employers to learn how to manage their workers comp programs more effectively. The Lynch Ryan philosophy is one based on the idea that workers comp is essentially a human issue and a management issue rather than one of merely dollars and cents. We believe that when it comes to comp, treating workers fairly is not only the right thing to do, but it is actually the least costly thing to do. Hundreds of conscientious employers that we’ve worked with over the years have demonstrated that point. We believe that one of the failures of the system has been that many employers lack an understanding of what comp is, and all too often, simply outsource it to insurers. Unless an employer is knowledgeable and fully engaged, the end results are likely to be disappointing. So we thought a blog would be a good forum for interacting with our constituencies. We decided we would post workers comp news and use the news items as a springboard for us to provide further information and discussion. We’d also be able to highlight and filter some of the great free resources available on the Web. While our intent was not to use the blog as a sales channel, we hoped that if we did a good enough job demonstrating expertise and delineating our philosophy, new business might be a byproduct. Early on in our posting, we became mindful that we actually weren’t just speaking to employers but to all other participants in the system too – injured employees, physicians, regulators, insurers, unions, attorneys, and many others. We saw this as a great opportunity because it’s no secret that part of the frustration bedeviling workers comp is that the various parties involved the system aren’t communicating effectively with each other. There are a lot of misunderstandings, misperceptions, and mistaken assumptions about what comp is and what it isn’t. We hoped that by providing information, we might shed some light on the matter. So 20 months into our endeavor, what’s the verdict? Has it been beneficial from a business viewpoint? We would answer a resounding yes. We are rather awed that for such a narrow niche topic, about 300 of you visit the site each day. We are honored to have earned kind words from such disparate sources as safety advocate Jordan Barab and industry trade publication Business Insurance, and to be read by labor unions and employment lawyers alike. We’ve had enough positive client feedback to know that our goal of being a useful educational resource is being met, at least in part. Also, blogging keeps us on top of our game – we have to stay up on the news, and because our posts are public and open to comment, we also have to go the extra yard to ensure accuracy. By visiting other bloggers who post on related topics, we are exposed to different ideas and perspectives. Also, we learn what’s on our readers’ minds: we see which search terms brought you here, and what information you are looking for when you search our site. This feedback loop helps us to better understand and address your concerns, or at least we hope so. The debits? We don’t see any, really. Well OK, maybe the spam. We had hoped we could spark more dialogue from readers through comments on posts, but a relentless flood of comment spam from unsavory hucksters forces us to shut down comments after a few days, if not sooner. I spent last week at the annual Risk & Insurance Management Society annual meeting in Philadelphia last week. This is one of the single largest events in the property and casualty industry, attracting thousands of attendees and exhibitors. A quick snapshot of the show reflects an industry in turmoil. When I reflect the first RIMS I attended in Orlando more than a decade ago, the changes are boggling. Industry giants from those days have disappeared, victims of consolidations or outright insolvencies; new, less-familiar players have emerged. It’s a challenging environment for risk managers. This year, in the wake of the Spitzer investigations shaking the broker world, the buzzword at the show was transparency and all the talk was about ethics and open customer communications. RIMS leadership called for members to take responsibility in the issue of disclosure. The Terrorism Risk and Insurance Act was also of some concern. TRIA renewal was much on the minds of attendees and the subject of several sessions. 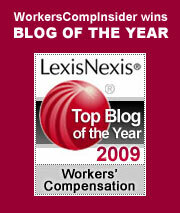 Rising workers comp severity trends and high medical costs were another issue of great concern. While frequency is down, the cost of claims keep increasing, largely driven by skyrocketing medical expenses. This concern was in evidence by the plethora of medical specialty services that dominated the exhibitor hall. Our friend and fellow blogger Joe Paduda reports on the trend to medical risk management, with particular observations on Pharmacy Benefit Managers (PBMs). The annual benchmark survey of risk managers produced for the Risk and Insurance Management Society by Advisen was just released, and shows that the property casualty market softened in 2004, although the high cost of WC and professional liability kept overall risk cost 3% higher than the prior year. For more information, read Michael Bradford’s report of the survey in Business Insurance. Congratulations are in order. We were very pleased to open our mailbox last week to see that James D. Hinton of HCA, Inc. was gracing the front cover of the pre-RIMS Business Insurance issue. Jim was named 2005 risk manager of the year in the publication’s annual award. Some of us at Lynch Ryan remember working with Jim in the early 90s when he was implementing workers comp programs at Humana – he was very progressive and ahead of the curve back then, so we are pleased to see him getting some well-deserved recognition. We try to keep up with the latest advice on staying healthy. It isn’t easy. Have you revised your personal food pyramid, based upon the new government guidelines? In addition to the complex new charts, the government has provided a printable worksheet for tracking your daily progress. You get to grade yourself on how well you ate on a given day: great. So-so. Not-so great. I would have added at least one more category here: “don’t even ask.” I wonder how I am supposed to distinguish between a “so so” and a “not so great” day. Clearly, a pig out is “not so great.” But if I order stir-fried tofu along with my spare ribs and General Gau’s chicken, am I allowed an upgrade to “so so”? As if the intricacies of the new pyramid are not enough, we now have the Journal of the American Medical Association warning us about being too skinny. (OK, I’m not really worried about this one.) In their study of mortality for the year 2000, they found that skinny people and obese people were both at higher risk for dying. They seem to recommend that the best way to assure longevity (or at least for surviving the year) is to get slightly overweight. So perhaps we’d best ratchet up our food pyramid to ensure a few extra calories. When it comes to calorie counting, I’ve always had trouble figuring out just how much the recommended 8 ounces of grain is, or the 3 cups of vegetables and 2 cups of fruit. How many cups is a banana? Do you have to mash the banana into a measuring cup to come up with an accurate count? Whenever I think this way, I start to worry. And when I worry, I really need a few chips and salsa to calm me down. By now, you are probably wondering what all this has to do with workers compensation. All of us, every worker in the country, implement a de facto food pyramid every day. We make myriad decisions that impact our health and well-being. Workers who consistently eat in the “great” category are probably at lower risk for certain kinds of injuries. (Of course, if they are self-righteous about it, they might not be much fun as coworkers.) Our physical well-being directly impacts our ability to do our jobs safely and our ability to respond to sudden hazards. Now if we could only figure out exactly what we are supposed to eat and how much we’re supposed to weigh! In working with thousands of employers across the country, one of the refrains we have heard all too often after a lost time injury is: “I was planning to fire him, but I never got around to it.” We advise our clients to terminate employees who are not working out before they get hurt. After an injury, workers are protected by workers compensation statutes which presume that any termination is simply retaliation based upon the injury. Workers compensation is not a good way to end the employment relationship. But how do you terminate people? Termination is full of risk. It’s not easy. It’s not comfortable. Indeed, it is tempting to overlook poor performance, in the vain hope that the problem will go away. All too often, the problem simply migrates to a company’s comp loss run. 1. You can’t eliminate risk you can only manage it – you cannot eliminate the risk that an employee will sue. All you can do is position the company in the best light in the event that the employee does sue. 2. It is personal – While the termination should not be personal for the manager, don’t ever think that it’s not personal for the employee – it is. 3. It is emotional – Never lose sight of the fact that deep and strong emotions are at play here. A termination always affects people, even when you suspect that the employee knows its coming. 4. Never lose sight of the fact that you have initial control – In most cases, and while it may sometimes feel otherwise, the employer is in control of the pre-termination process. 5. Use employment contracts or letters of offer – Many employers wish they had these carefully drafted and properly entered into employment contracts in place when the point of termination comes and they hear the bad news about how much, at common law, they will likely be required to pay the employee. 6. Do your homework – If there is something to investigate, do so, thoroughly and completely. Document your investigation through careful notes (dated, signed etc…). Keep the notes and other file material in a safe and secure location and preserve the evidence. If you’re going to terminate for just cause, then make sure you have the goods. 7. Get advice – This may seem self-serving (as Fitzgibbons is an attorney) but it’s generally better to be proactive and get some legal advice before carrying out the termination. It’s generally easier to place the pieces on the board than to pick them up off the floor. *	Try to get into the head of the employee – who is this person? what’s he/she going to be concerned about? how can we best deal with this individual? Resist the cookie-cutter, one size fits all termination approach. *	Assuming you’re terminating without cause, and are providing a severance package, what will that package be? *	If you’re terminating for just cause, how much detail should you provide the employee? Have you done your homework? *	In most cases, a termination letter should be prepared and available at the termination meeting along with all other documents (i.e. a release) that the employer will require the employee to sign. Give the employee reasonable time to obtain legal advice. *	Who will attend the termination meeting? Who will do the talking? *	Be sensitive to issues of location (you want a private location) and timing (you want to carry out the termination at a time when the office is quiet). In short you want to avoid the employee having to take the long-walk through the office past co-workers and customers carrying a box of personal belongings. *	What day of the week? There’s no rule here, but Friday terminations should be avoided, if possible, because the employee will not be able to get legal advice over the weekend and will turn to anyone with an opinion (typically family who will supply well meaning, though possibly less than qualified, “legal” advice with the effect that, come Monday, the employee will be all fired up and itching for a fight). *	Does the day on which you are intending to carry out the termination have any significance for the employee (i.e. it’s his/her birthday)? If so, think of another day. 9. Don’t let the meeting get out of hand – Be firmly and politely decisive. Once the business has committed to terminate, the sole purpose of the meeting is to carry out that decision. Keep the discussion focused. 12. Eat crow while it’s young and tender – Translation: be fair and reasonable (that’s not the same, by the way, as writing a blank cheque to the employee). For a little more detail, visit Fitzgibbon’s weblog. In the meantime, this might be a good time to review your team roster. Make sure you want these people with you and they want to be with you. When the employment relationship is not working out, it’s best for all parties to end it. As Fitzgibbon’s blog points out, how you end it will go a long way to determine whether the termination is truly the end, or just the beginning of a litigation nightmare. “Exclusive remedy” lies at the heart of workers compensation. In exchange for the protection of workers compensation benefits, employees give up their right to any other remedy for workplace injury. This generally works out pretty well for both parties, but as with so many issues, the action at the margins is intense. There are two areas where challenges to exclusive remedy tend to emerge: where injuries are deemed to be intentional – especially where the employer ignored explicit warnings or even crossed over into criminal negligence; and where workers compensation appears to be an inadequate remedy. In an article posted by NCCI and authored by attorney Charles Tenser (Acrobat Reader required), the exclusive remedy concept is shown to have bent, but it has not broken. Tenser points out that many states allow employees to sue employers when the injuries are determined to be intentional. Of course, it’s usually pretty difficult to prove intention. No matter how egregious or careless an employer might be, it’s not easy to reach a standard that looks for proof of intention. As a result, attorneys are looking at the concept of “substantial certainty.” In other words, while the employer might not have intended to cause the injury, under the specific circumstances there was a substantial certainty that an injury would occur. It’s interesting to note that the door in New Jersey does not appear to be wide open to exclusive remedy exceptions. In Fisher v. Sears Roebuck, the court dismissed a suit brought on behalf of a security guard who was killed during a robbery in a parking lot while transporting cash receipts. The court held that the dangers faced by security guards did not amount to a “substantial certainty” that injury would occur. The dangers, in other words, are simply inherent in the job. While courts have generally resisted the temptation to undermine “exclusive remedy,” they are at times receptive to the idea that if workplace injuries do not fall under workers compensation, some other remedy must be available. Tenser cites a case in Oregon, where the court held that the exclusive remedy provision of the workers comp law violated the state’s constitutional guarantee of a remedy where it required a claimant to show that his employment was a “major contributing cause” of his occupational disease rather than simply a “contributing cause.” In other words, in falling short of the standard for comp, the employee had no recourse of any kind, which the courts found in violation of the state’s constitution. The Oregon legislature subsequently established procedures for allowing a negligence action against employers after potential comp remedies have been exhausted. When employers act egregiously and without regard for the safety of their workers, it is indeed tempting to open the doors to tort liability. In the New Jersey case discussed above, the door opened, just as it should have. But for the most part, the exclusive remedy provisions of comp statutes have proven their worth over time. In the great trade off at the heart of comp, employees give up their right to sue employers, in exchange for the relative certainty of indemnity and medical benefits. It is by no means a perfect system. There are employees who take advantage of it, just as there are too many employers who ignore safety standards, putting their employees at risk. For the most part the system accomplishes what it is supposed to do: helping injured workers provide for their families as they recover from work-related injuries. We should think long and hard before changing the rules to encourage a fault-driven system governing disability in the workplace. Every year health and safety activists and unions around the globe set aside a day to remember the thousands of workers who are killed an injured on the job each year. Jordan Barab, a fellow blogger and a tireless and impassioned advocate of worker safety, suggests that the day should a time to “recharge our batteries” and rededicate our commitment to worker safety. He points us to some resources for April 28. If you have any doubt about the importance of such a day, just read through one of his chilling reports of the weekly toll. We suggest that it might be a good day for risk managers and employers everywhere to conduct an audit of their own record and practices. Safety should be an ongoing concern every day in every work place – but perhaps this would be a fitting day for employers to take an inventory – what better way to remember to those who died on the job? One of the nooks and crannies of workers comp that often gets short shrift is the issue of recovery. Many employers and insurers can recoup claim expenditures through second injury funds or subrogation, for example. Since this is a large area, today we’ll briefly discuss second injury funds, and return to subrogation at another juncture. Second injury funds were designed to encourage employers to hire employees with disabilities and pre-existing conditions by offering a mechanism for cost relief should the employee experience an injury that aggravates the existing condition. In recent years, many states have eliminated these funds, but they still exist in about half the states. In most instances, these funds are financed by assessments on insurers and employers. For a primer on second injury funds see Second Injury Funds: Still a Valuable Cost Containment Tool (PDF) by Mark Nevils of Insurance Recovery Group (IRG). This article describes the various types of state funds, and the way they work. IRG makes the case that there is as much as $1 billion in untapped potential, and that failure to recognize and pursue these opportunities can be costly since qualified claims are usually longterm in nature, often over $100,000. To learn more about this untapped potential, see IRGs articles Second Injury Funds: Maximizing Your Recovery Results (PDF) by Fred Uehlein and Dorothy Linsner and Closing the Recovery Gap (PDF) by David Jollin and Fred Uehlein.